Here are Tuka and Fluffy, two illustrations I recently created for The Monster Project this year. The Monster Project consists of giving artists and designers monsters drawn by young kids to reinterpret. The new monsters are then printed and given back to the kids as posters! This was coordinated by my coworker and friend Jonny Abowd and his wife, Laura who teaches 1st grade. This was inspired by, though not directly affiliated with, the official Monster Project which was a successful Kickstarter project in October 2015. I created the monster Tuka for Cale with Procreate on iPad Air and an Adonit Script stylus. I highly recommend Procreate if you're looking for a really robust illustration app for your iPad or iPhone. One of the coolest features is its ability to create a time lapse of your illustration automatically. For a change of pace and style, Fluffy (the one who loves donuts) was created for Maddie with Adobe Illustrator CC. This was a past project I realized wasn't on my site and I think deserves to be on here. Designed for iPhone and iPad Air, this dual dock is the consequence of my frustrations with the current charging experience. I had a few major requirements when I started this project: use existing charging cords without modifying, create the ability to plug-in devices without looking, and don't use any moving or mechanical parts. 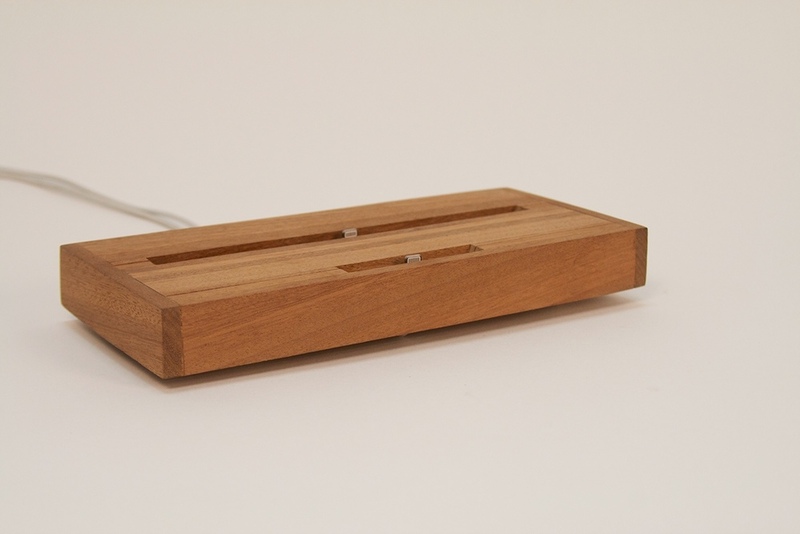 The result is a minimalist sapele wood slab with a hidden seam to separate the two pieces and release the two charging cords. Touch Lamp was created out of a necessity for a great table lamp. Most lamps have cumbersome switches by which a half-asleep human can be easily frustrated, so Touch Lamp does away with them. Touch anywhere on the aluminum ring to turn the lamp on. Touch again to turn it off. In addition to cumbersome switches, Touch Lamp does away with traditional lamp shades, that get dusty and worn, and replaces it with a glass sphere. 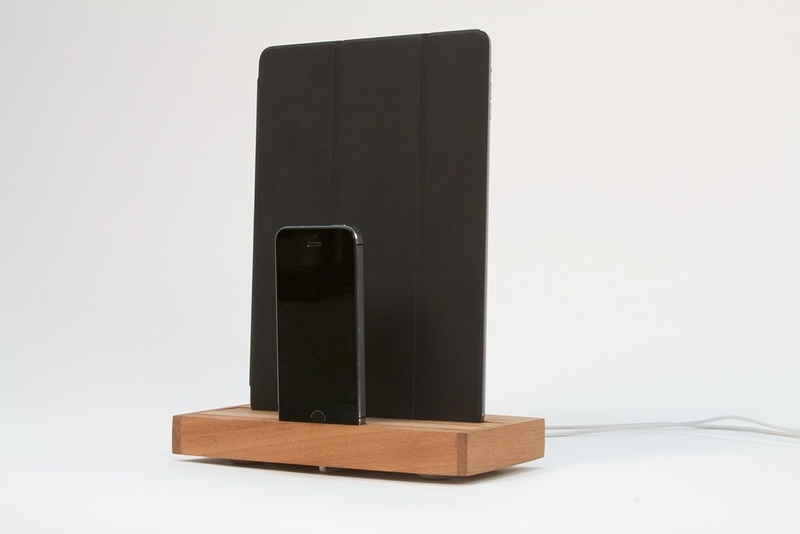 The base is turned and sculpted from African Mahogany and the power cord is soft, woven nylon. 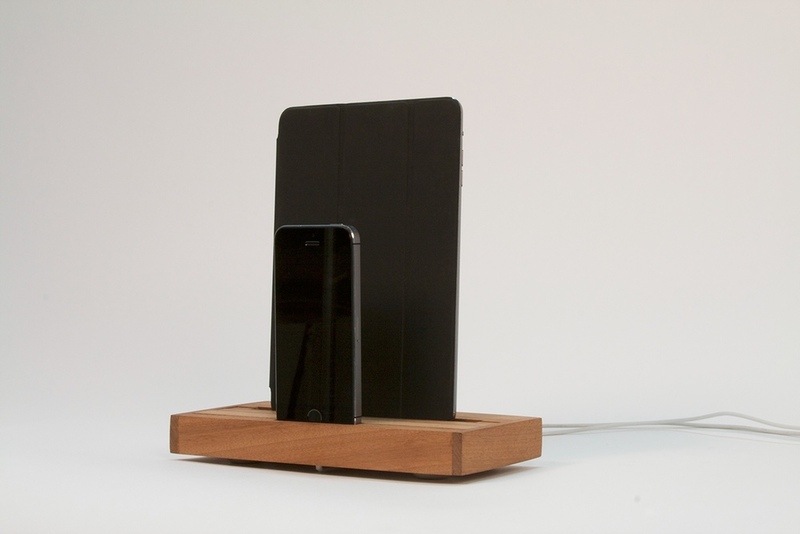 The form has an inherent ability for power cord to be fed through any direction relative to the power source. These features work together to fit our human habits and lifestyle, instead of forcing specific behaviors, in order to create the most enjoyable lamp experience possible. If you have used a smart phone, you have seen and used the infamous Hamburger Menu. This is the icon composed of three stacked horizontal lines, and usually means "there's stuff under here". This surely came about from experience designers that needed to fit a lot of pages and data on a mobile app and ran out of space to put it. This brings up a problem regarding the volume of information and pages that should be presented to users in order to not cause information overload or hide information and options. Another problem with the hamburger menu is that it is an 'un-icon', in other words it does not give specific context to where you going in the app, or represent what you will find when you get there (that's why icons exist). This 'un-icon' status has caused it to be used as a catch-all for navigation pages, settings, account details, and anything else you can think of. A "Silver Hamburger" for anything you want to get into an app, but won't fit anywhere else. If an app has a lot of pages or is a responsive website, a hamburger menu can make sense, but there are some cases where it is completely unnecessary and hides important content, especially in a native application. Hamburger menus have a bad habit of putting entire pages of an app out of sight and out of mind. Users have to remember what's behind the hamburger curtain. Let's take the Level Money app for example. I have used Level Money for a few years now, and love it. It's definitely the most useful money management app I've found and used over a long period of time (including Mint). One reason I love Level is its simplicity, there are only 5 main pages in the entire app, but for some reason there's also a hamburger menu with redundant navigation links. With just a couple of minutes in Photoshop, I was able to expose all page navigation, remove the hamburger menu, include a settings icon in the upper right corner, not lose any functionality, and not change a single page. If you're still not convinced, head on over to Luke Wroblewski's website for more examples of this design adjustment in action.